Jamiedidit: Don't hate on the octopus. Back in my babysitting days, I used to have pregdar. I don’t know if you have heard about pregdar, but it is a really handy superpower giving one the ability to detect pregnancy at a very early date. I could always tell when one of my families was going to increase their ranks before I was supposed to know. I don’t know what it was. It could be that pregnant people so often unconsciously touch their bellies. It could be that they have some weird extra pheromone only dogs and Jamie can smell, I don’t know. I can tell you that the magical pregdar ability faded when I stopped babysitting on a regular basis. And I used to miss having that particular superpower. It would have been useful (and possibly even profitable) in college. Like, maybe, right after Spring Break. I could have been the Oracle of LaGrange College. Now, however, I am only too happy to be free from the pregdar. If I still had my pregdar, that sucker would be continuously beeping. Think of a cell phone that is just before losing all battery power. You know that little “boop boop boop” that sounds every five minutes or so? That is what my life would be like with pregdar. Everybody I know is pregnant. People had warned me. They all said as soon as the bridal showers stopped…the baby showers would begin. And they were right. In fact, I just gave my first baby shower as a hostess, for my friend Nicole and her soon-to-be-here daughter Amelia. Paisley and I hosted and it was tres chic, if I do say so myself. I even made a diaper wreath. But that’s only the tip of the ol’ iceberg. Pregnancy is running rampant throughout my group of friends. Scads of them. Three in my book club alone! (I hear Dave Matthews singing “Don’t Drink the Water” somewhere.) In fact, just a few minutes ago I got an email from another friend who is newly pregnant and due in February, but I am not going to tell you who Mystery Preggers is. I hate it when people ruin a surprise like that, don’t you? And I am so happy for all these friends and so excited to meet all these new little people! And of course, this means I get to discuss baby names – glorious, glorious baby names! But, secretly…well, secretly until I decided to put it in a blog…I am a little sad. Not so much sad as raging, out-of-control, green-eyed jealous. I have become the main character in a bad Lifetime movie. The one who looks longingly at large amounts of white eyelet and gingham. Who seriously considers buying a fabulously tacky octopus dress because maybe someday……you know? I mean how cute is this? How fun would this be? My kid would be the anti-Lilly! For some reason, my friend and I and women like us – even as women in our early thirties - are not supposed to think about or talk about having children while we remain unmarried. And that extends to our respective boyfriends. The Todd and I talk about having children in the abstract….like, “Hey, honey, does the name Jemima make you think of pancake syrup?” or “Hey, Babe, if we ever have a son, will you swear you will never make him wear one of those girly looking rompers?” (Answers: No and….perhaps.) But if I went home and said, “Honey, I think it’s time we bought an ovulation kit.” the Todd would turn 17 shades of green and probably have to lie down. And that’s not even a tiny little piece of what the folks would do. They would totally forget that I am nearing middle age with a quickness. They would act as though I had been found in the back seat of a car on prom night. In reality, I know that this is not the time for us to have a baby. Not until the Todd can keep it to, maybe, five shades of green. We’re just not ready for it practically or financially. So, Mom, when you read this, I promise I am not pregnant or planning to be so anytime soon. But that doesn’t mean I don’t long for it sometimes. So, now I am back to trying to stifle the baby jealousy. And I think I do a pretty good job, usually. I haven’t been caught in the nursery section of Walmart in at least six weeks. And I am happy for all my pregnant friends – absolutely, incandescently, radiantly ecstatic for them. 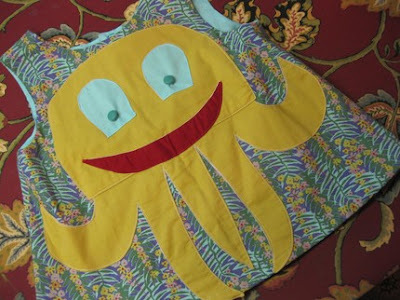 But there is always that little piece of me that really, really wants to buy tacky octopus dresses off Etsy. Jamie. I read a portion of this aloud to my co-worker. The part about being caught in the back seat of a car on prom night. I died. If you were still babysitting - you wouldn't have baby fever. They are hard and cry-ey and give you colds. Also. I've missed you. To tears.